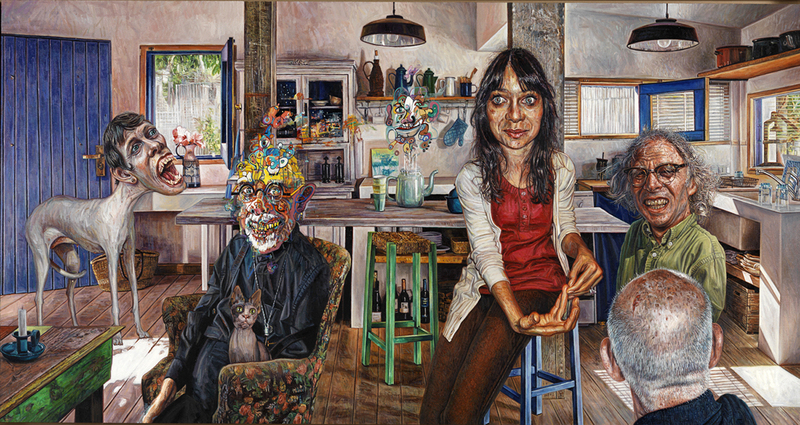 The Banker’s Daughter (2009-2010) is a relatively small oil painting (20 x 38”), with five disparate figures and one cat, all curiously placed together in a rustic kitchen. There is little character interaction except from the representation of the artist’s friend Chuck Close, whose exuberant smile of rotted teeth is directed out towards the viewer in a display of infantile madness. The character on the opposite end has the same smile, but with eyes so squinted it becomes uncomfortable to return his gaze. The eponymous daughter sits straight up to the left, sliding off a stool while plate-sized blue eyes stare off into nothing, her overlarge hands awkwardly playing with themselves. Mark Greenwold, “The Banker’s Daughter,” 2009-10. Oil on linen, 20 x 38″. Courtesy of the artist and Sperone Westwater. Like a psychoanalytical crossword puzzle, this painting is exquisitely rendered and left open to association, the pools of colorful abstraction dipping in and out of recognition. It is a who’s who of art world insider references, though that’s not necessarily the point. Rather, it is a deliberate, masterful, and off-off-center painting that presents us with an effortlessly surreal tableau. In the way dreams are, it is absolutely natural until you wake up. Who are these people? Why are they here and why aren’t they talking? Specifically, why aren’t they addressing the greyhound with a human head, screaming in the corner?